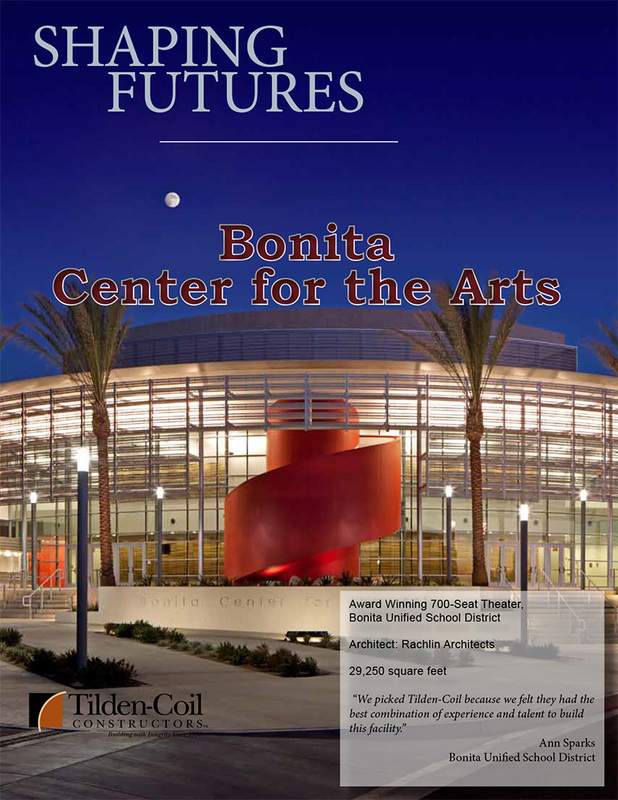 Tilden-Coil Constructors is proud to present the Bonita Center for the Arts—a new 700-seat performing arts center designed to support local school programs in the Bonita Unified School District as well as visiting theatre companies. This state-of-the-art performance theatre will serve the local community with a broad selection of artistic programming including musical theatre, drama, vocal and instrumental performance, dance and lectures. Twenty-five years in the planning, the communities of San Dimas, La Verne and the Bonita Unified School District aligned together to make this artistic gem a reality. Employing a Lease-Leaseback/Integrated Project Delivery method, Tilden-Coil partnered with Bonita Unified and Rachlin Architects, taking the lead in weekly IPD meetings to ensure that client objectives were met. The team established and tracked deliverables weekly throughout the design process with the client’s budget and performance criteria as the end goal. This collaborative process yielded a beautifully designed and functional performance space all within budget parameters.